Since I’ve been in this nostalgic mood during the past winter and spring, I’ve revisited one of my favorite towns on the Chesapeake. 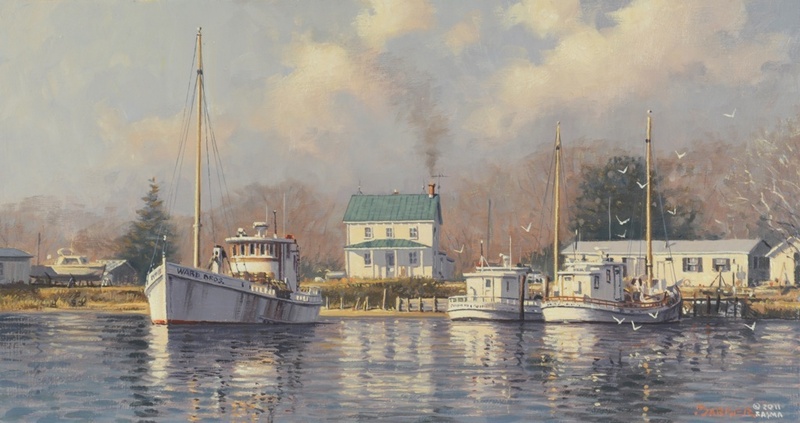 This painting shows the harbor of Jackson Creek in Deltaville, Virginia and is similar to a larger piece done by me in 1985. The earlier piece, “Buy Boats on Jackson Creek” was published as a limited edition print and quickly sold out. If you could find one available today it would sell for $895 unframed. This new painting shows Captain Johnny Ward’s dock as it appeared in the mid 1980s, with his family’s boats rigged for crab dredging. In those days there were nearly a dozen of these “buy boats” on the creek but today they are a rarity indeed.